Here are a couple of ATCs I made a while ago for swaps. 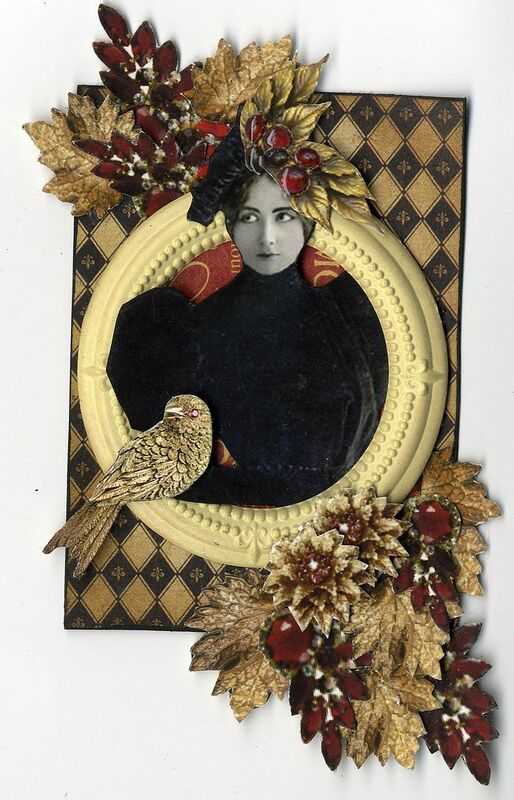 The jeweled, leaf and bird images on the one above are from my Bejeweled Collage Sheet. 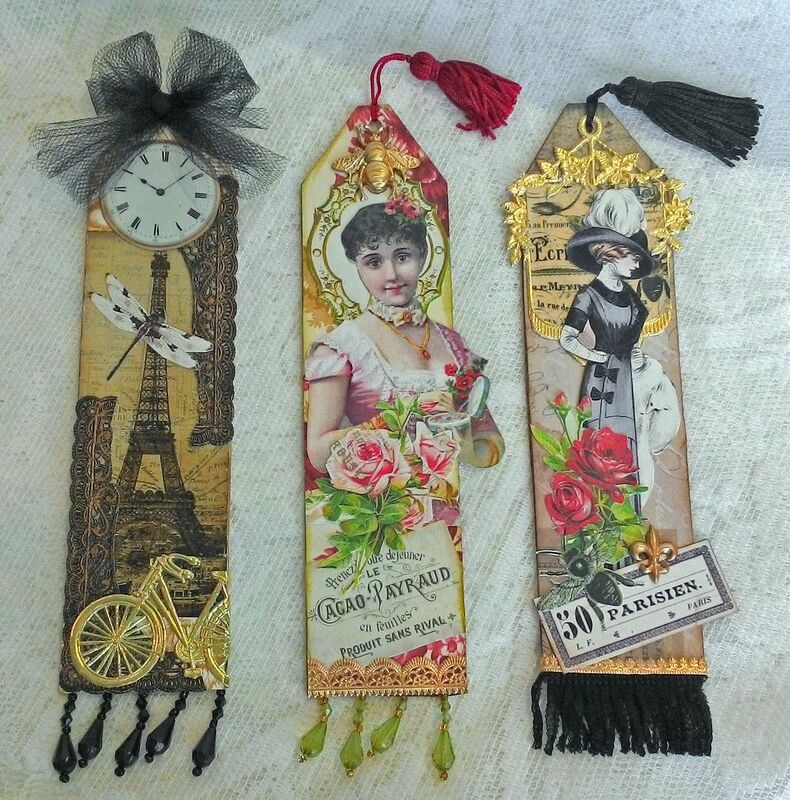 When I was working on the Springtime in Paris altered book in the previous post, I decided to make some bookmarks. 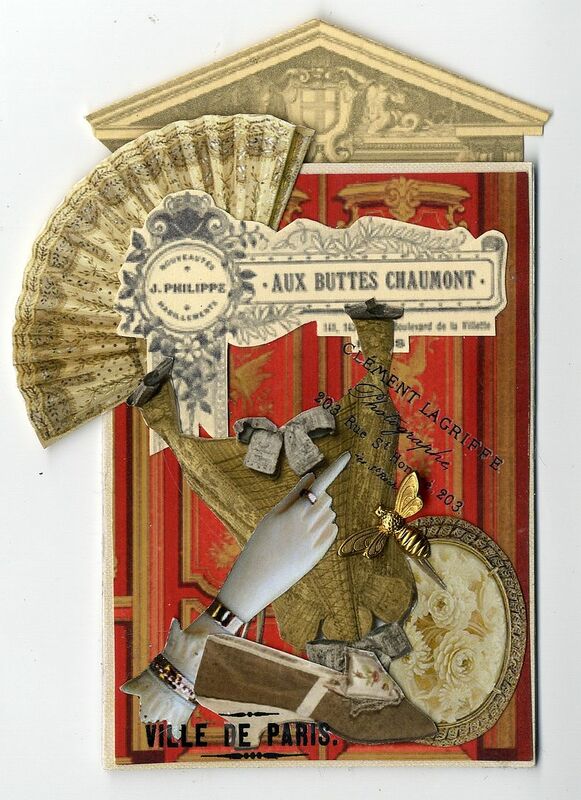 I started by cutting out the bookmark shape in heavy chipboard. 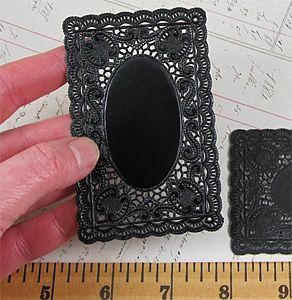 To frame the Eiffel Tower I cut apart a black doily frame and use Gilders Paste to accent the raised areas. 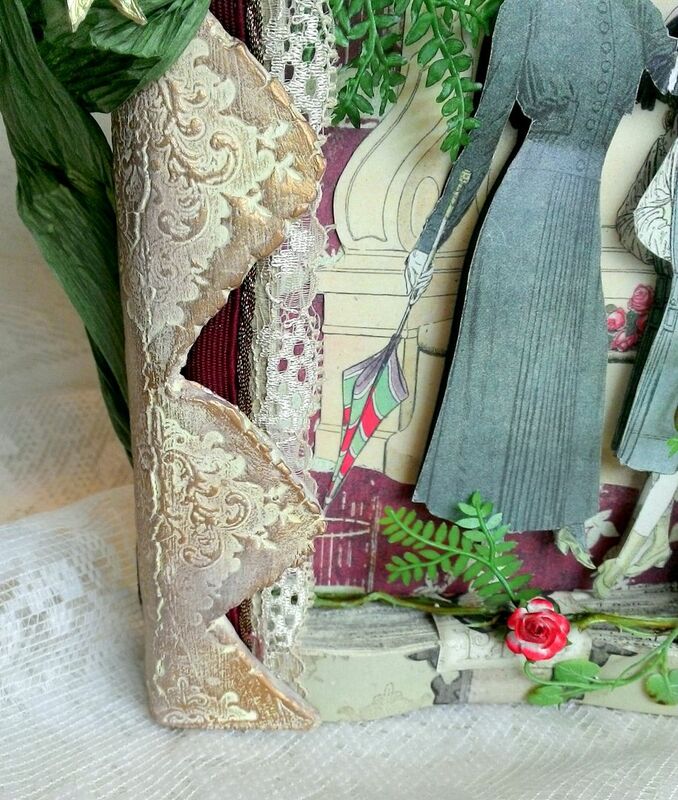 Just like I do with my ATCs, I went off the edge of the bookmark with the image of the Victorian lady. The fringe at the bottom is black tulle. 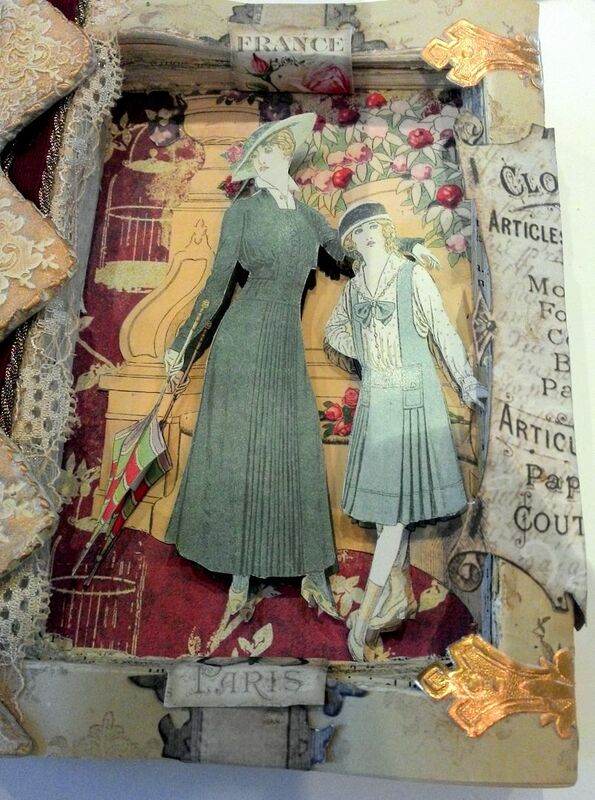 On the Dresden banner I applied a piece of the French Floral Overlays Collage Sheet printed on vellum. You’ll be seeing a lot more pieces from me using that collage sheet in all kinds of different ways. 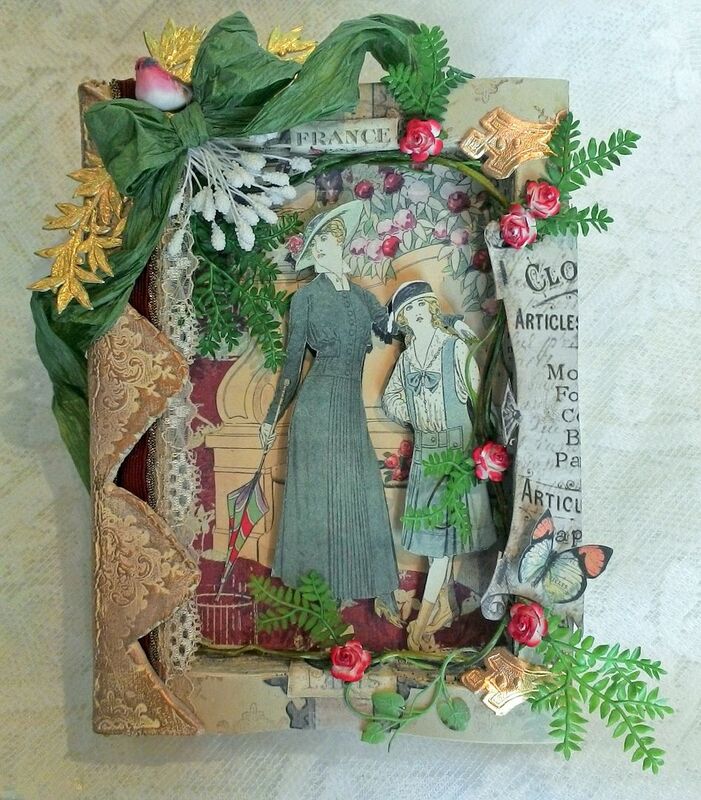 Its springtime in Paris and my homage to the season is this altered book. 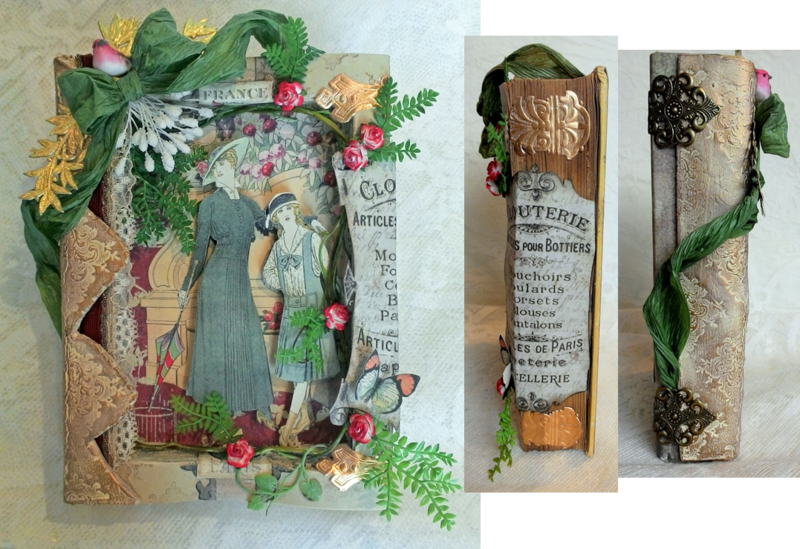 Unlike other altered books I’ve shown you, I’m using decorative images and paper to hold the pages together rather than gluing them to each other; a big time saver! 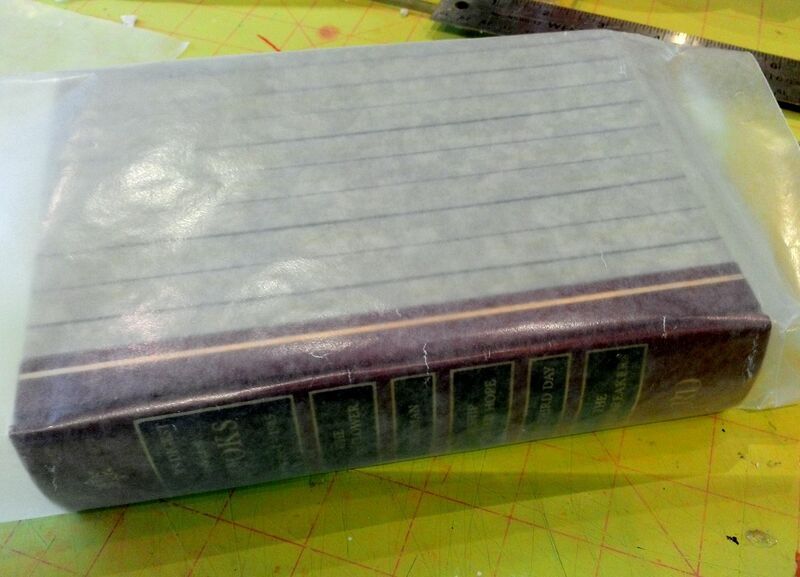 I’ve shown you how to stamp on paper clay and how to mold stamped clay to a bottle, so how about stamping clay and molding it to a book spine. Since it takes a while for paper clay to dry, I started by making the stamped piece for the book spine. First, I rolled out paper clay on a piece of wax paper. 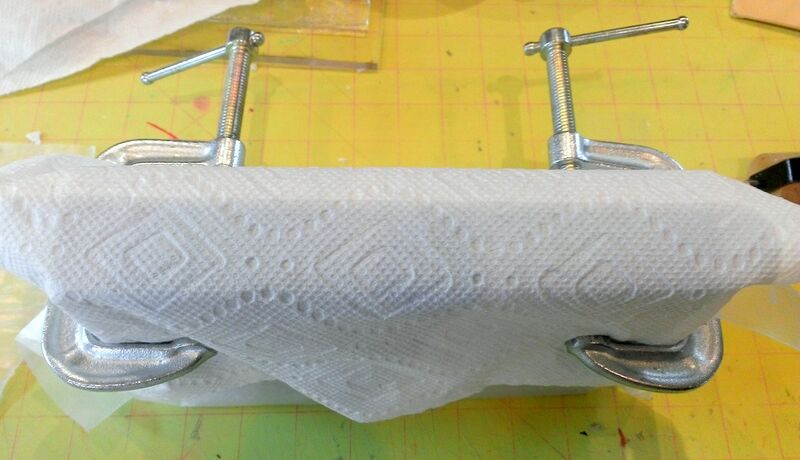 You could also use a non-stick craft sheet or tin foil; anything that keeps the clay from sticking to the surface. 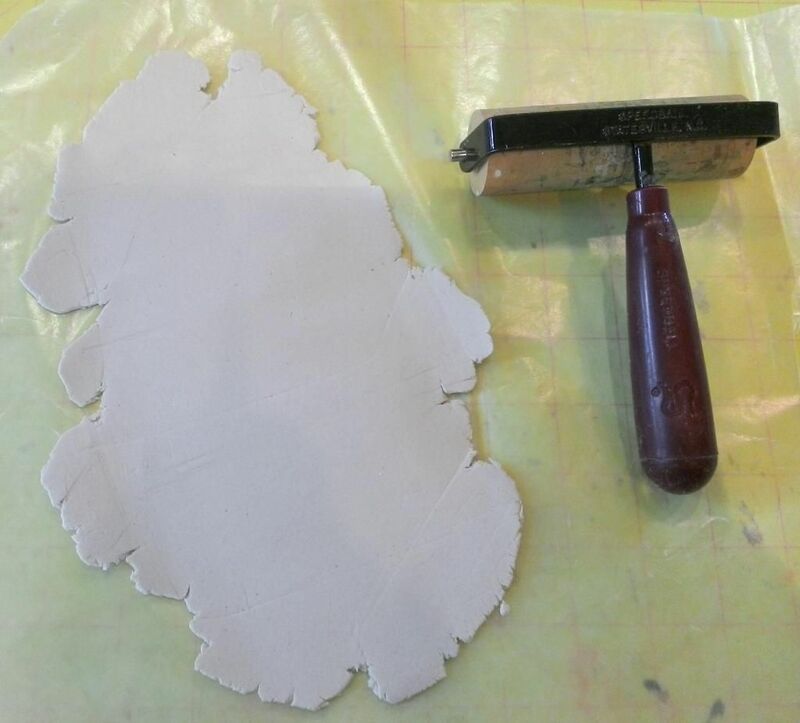 I used a brayer to roll out the clay to a thickness of about 1/8” thick. 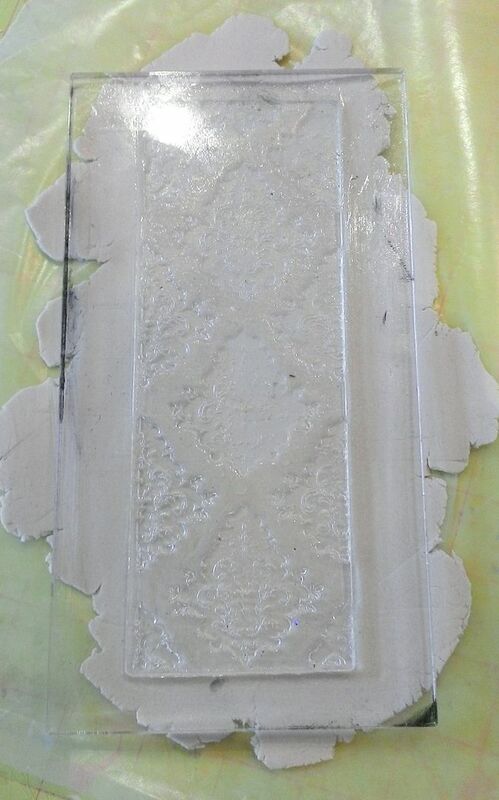 Next, using a yummy damask clear stamp, I pressed the stamp firmly into the clay. 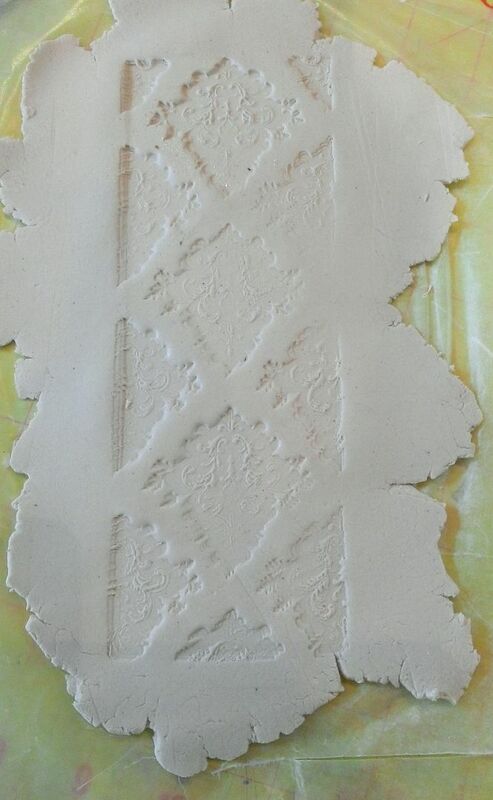 Carefully remove the stamp from the clay revealing the pattern which will become more prominent when colored. Next, I trimmed one side and the top and bottom of the clay using a metal ruler and X-acto knife. I used the X-acto knife to trim away some of the clay on the right side. After the clay dries I will sand away any remaining excess clay. Note: Paper clay shrinks when it dries so keep that in mind when deciding how much clay to trim away and what stamp to use. Since I wanted the clay to curve around the spine of the book I needed it to dry in a curved position. I wrapped wax paper around a second book (which is the same size as the book I altered) to protect the book from the moisture in the clay. 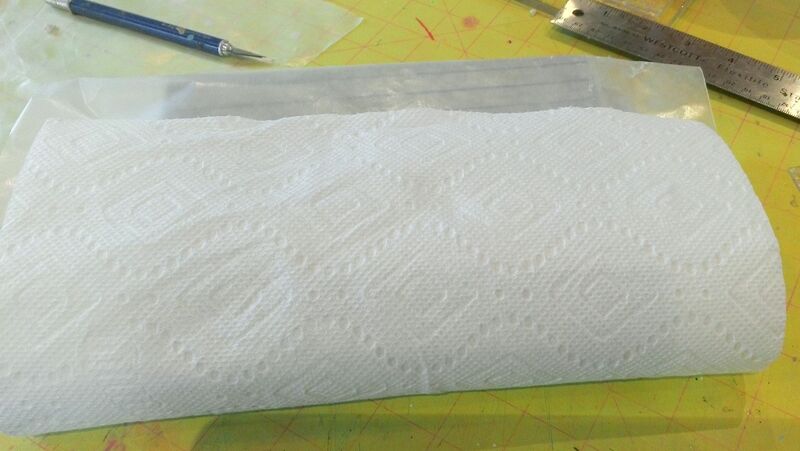 To help draw the moisture out of the clay, I wrapped the end of the book with a paper towel. I used a pair of C-clamps to keep book closed and the papers in place. Next, I carefully molded the clay around the spine of the book in the same position as I will attach it to the altered book. Notice the cracks. You may find that you clay cracks some when you bend it. 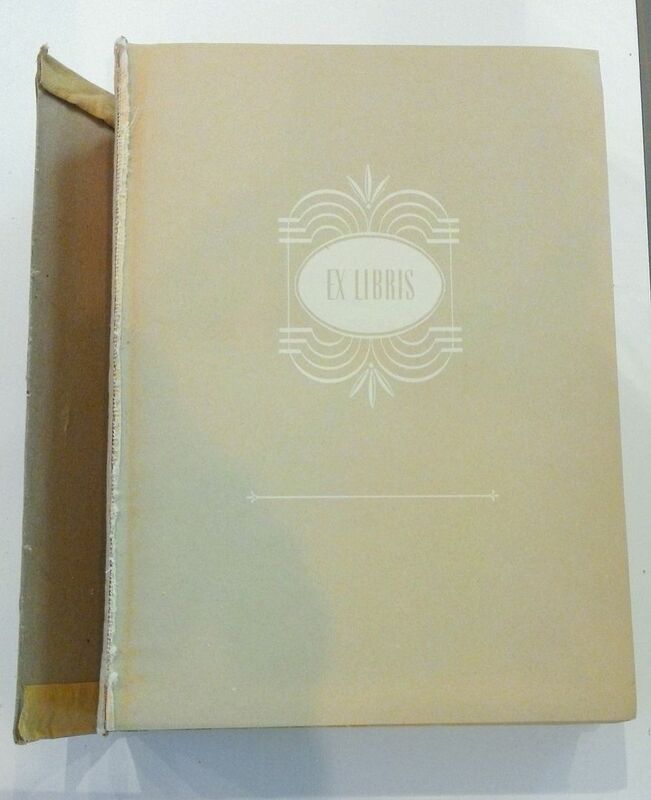 Personally I think it adds to the vintage look of the book. If you don’t like the cracks, use your finger dipped in a small amount of water and gently rub out the cracks; be careful not to rub out the design. Let the clay dry (could take 2 days). 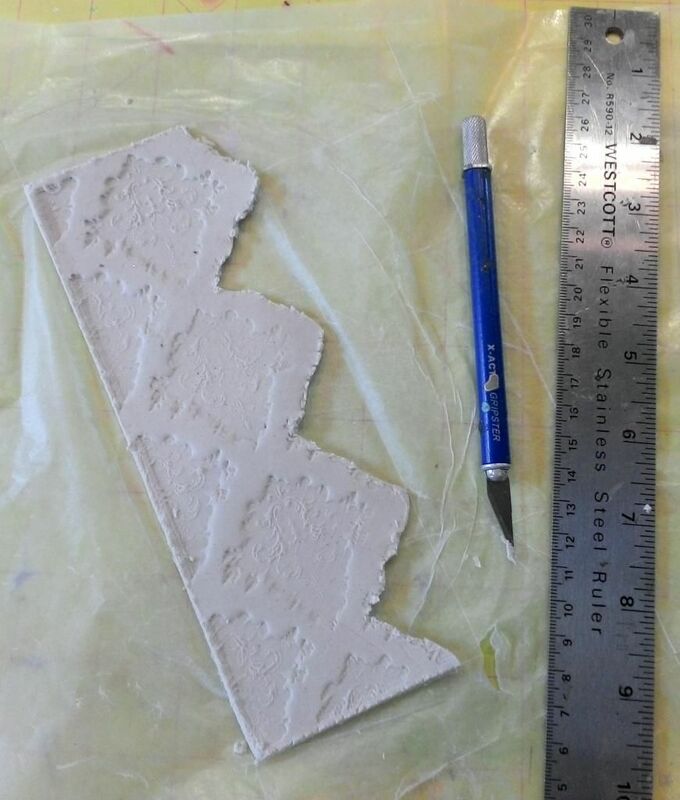 After a couple of hours, you might want to lift the clay piece off the paper towel to allow the towel to dry and then place the clay back on the book. Paper clay likes to curl or warp as it is drying. Once the surface feels dry, you can place a light object on the surface to keep it from curling as the back and insides of the clay continue to dry. If you have never worked with paper clay you might want to use just a small piece and experiment so that you can get a feel for how long it takes to dry in your climate and how to prevent warping. Once the clay is complete dry, you can sand away any excess or rough areas. Once I sanded the clay I painted it with pale yellow acrylic paint. Next, I used Walnut Distress Ink and a sponge to add more color and to make the pattern pop. 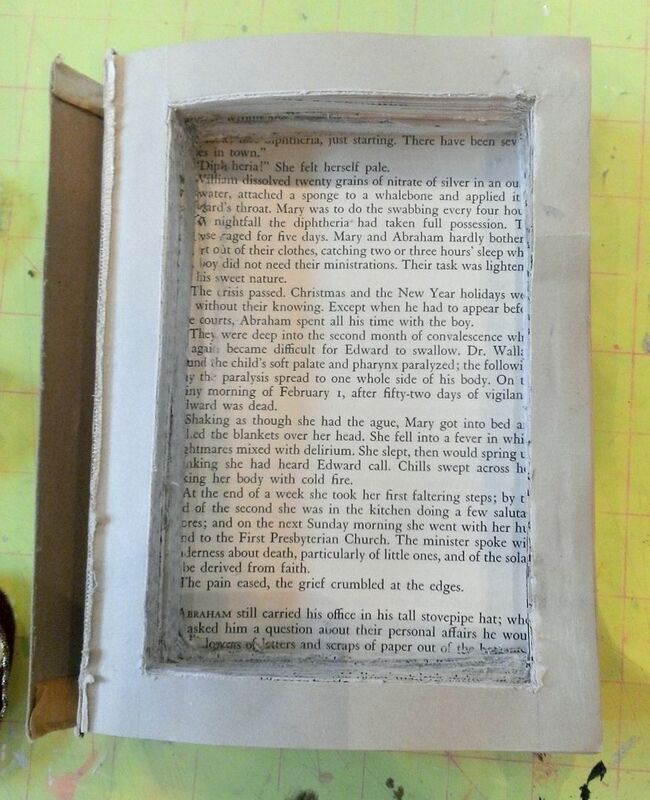 The picture below shows how it looks although unlike in the picture, I did this before attaching the clay to the book. Originally, the plan was to stop coloring the clay after applying the ink but I then decided (after I attached the clay to the book) to add Inca Gold Gilders Paste to the raised parts of the design. 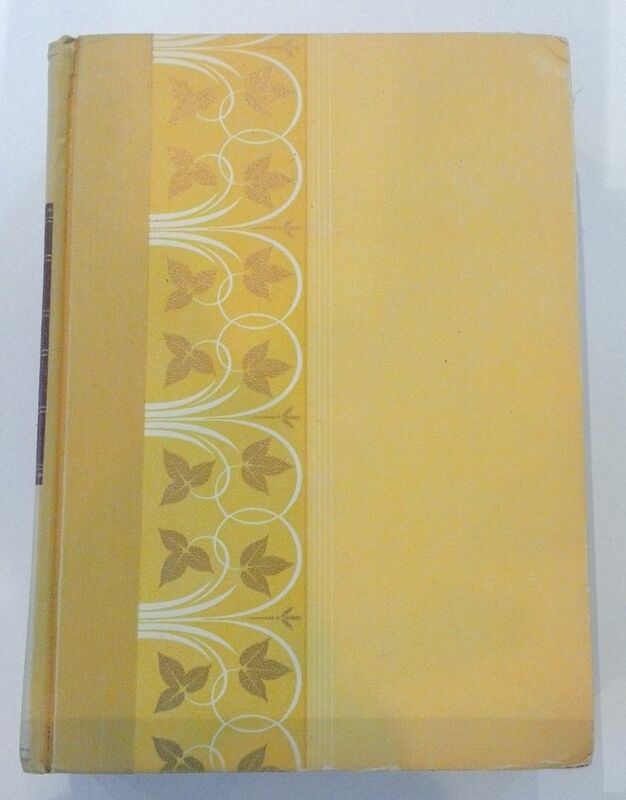 The gold complimented the other gold accents on the book. I started with an old Readers Digest Book (I have tons of them). I choose one with a yellow cover as I am not going to cover the edges and I thought the yellow would coordinate with the other colors. Next, I removed the front cover using an X-acto knife. 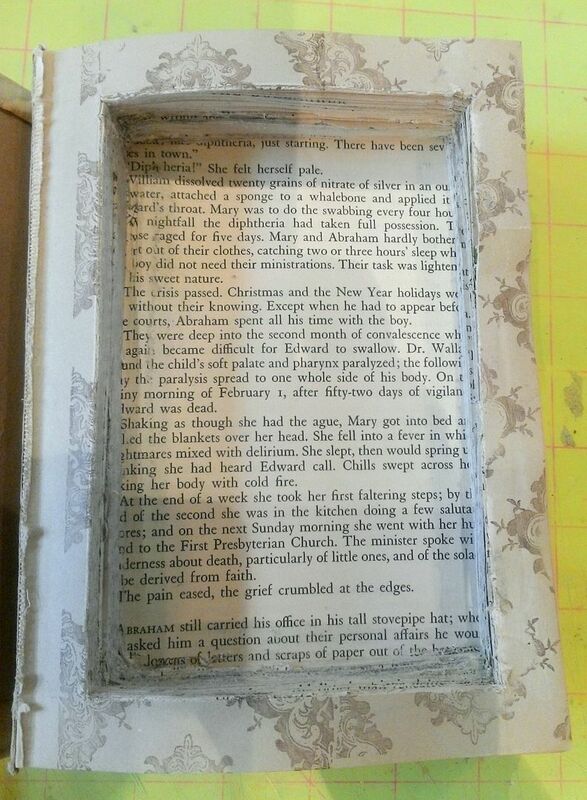 Once I decided on the size of the shadowbox, I cut a hole through pages in the book. The depth of the hole depends on the embellishments you intend to use. I used a piece of sandpaper to sand away some of the ragged edges. I stamped the front page of the book with the same stamp I used to create the clay spine. 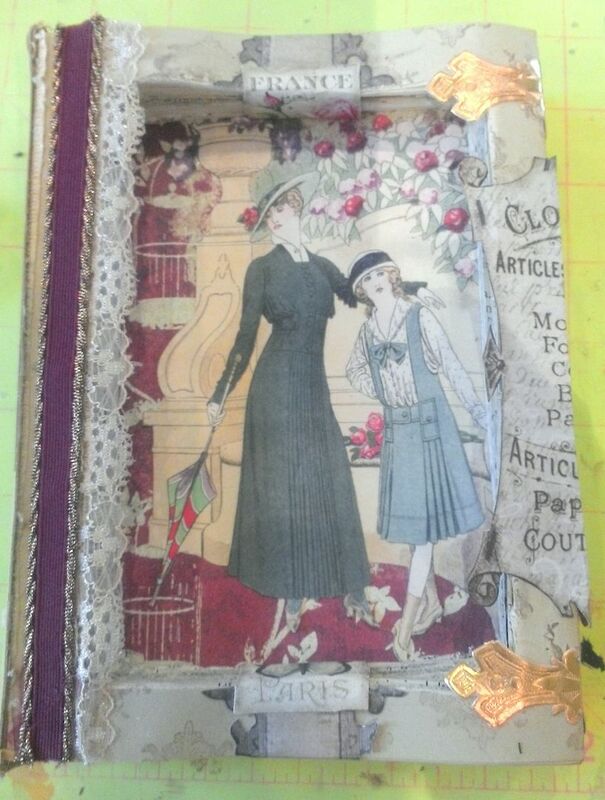 Now the fun starts and you can begin adding images and paper in the shadow box. 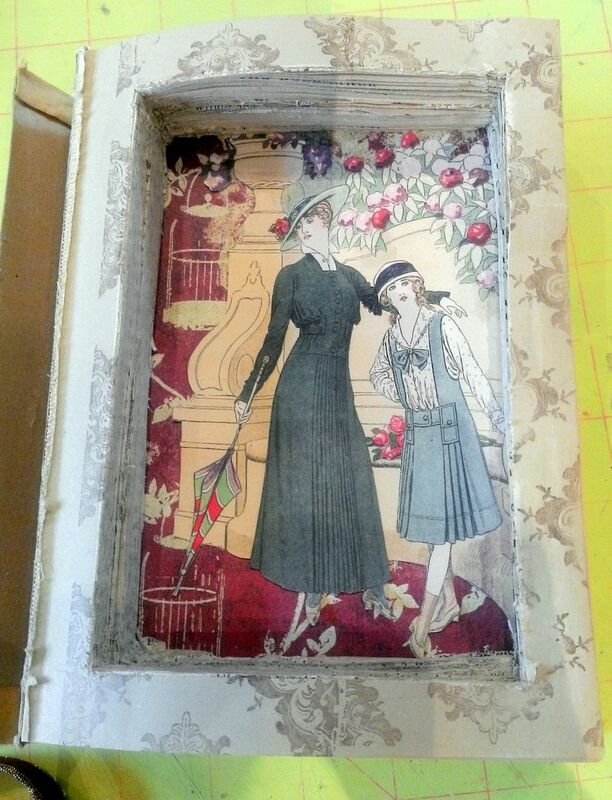 Anything you want to attach to the back of the shadow box should be done before combining the pages. 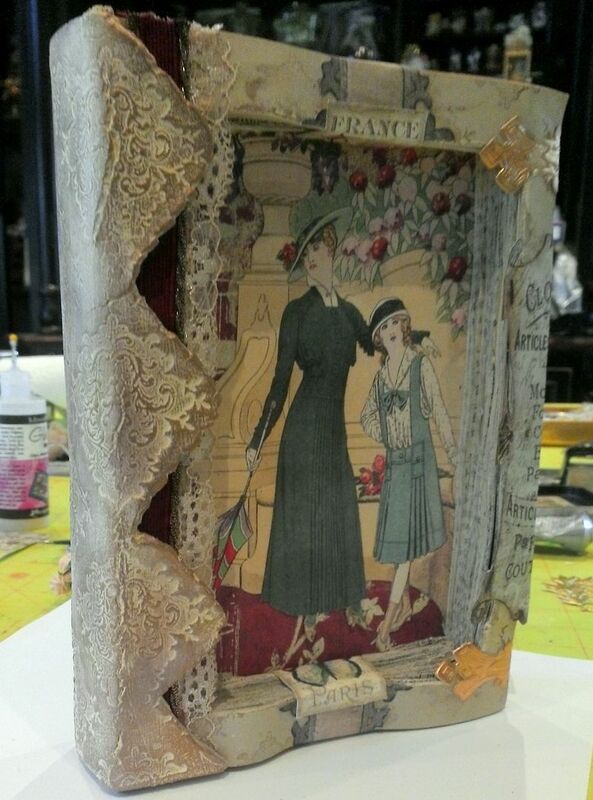 For this altered book, I did not glue the pages together to keep them in place. 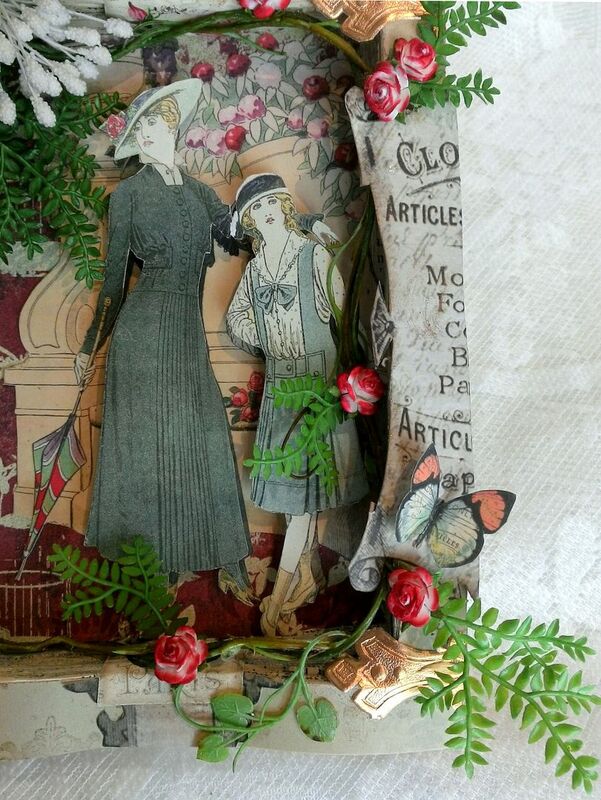 Instead, I used decorative paper and images glued to the first page in the book and then wrapped around the pages and glued the last page in the book. I did this on the top, bottom and right side of the book. This keeps the pages together and saves you the tedious job of gluing each page to the next. Once you have the images glued to the top, bottom and right side of the book you can glue the last page to the back cover of the book. If the spine of the book separates from the book when you remove the cover, you can glue it to the spine of the pages (which is what I did for this book). 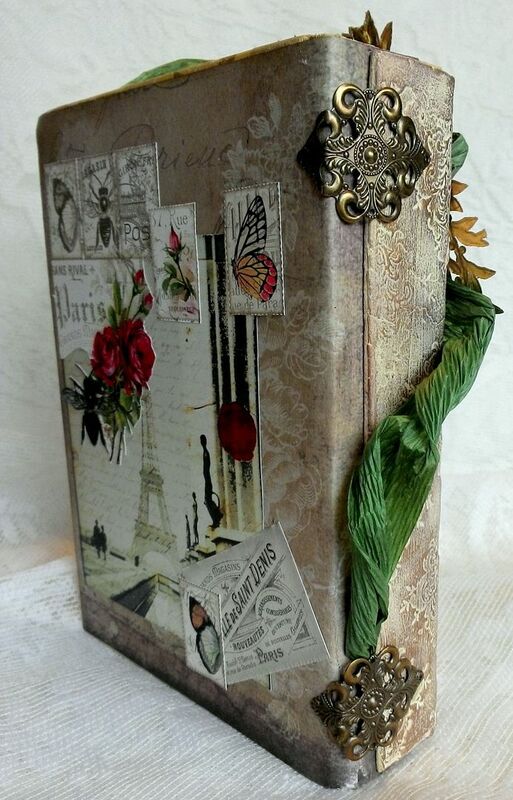 Other decorative elements that I added to the book are the Dresden hardware, lace and ribbon. 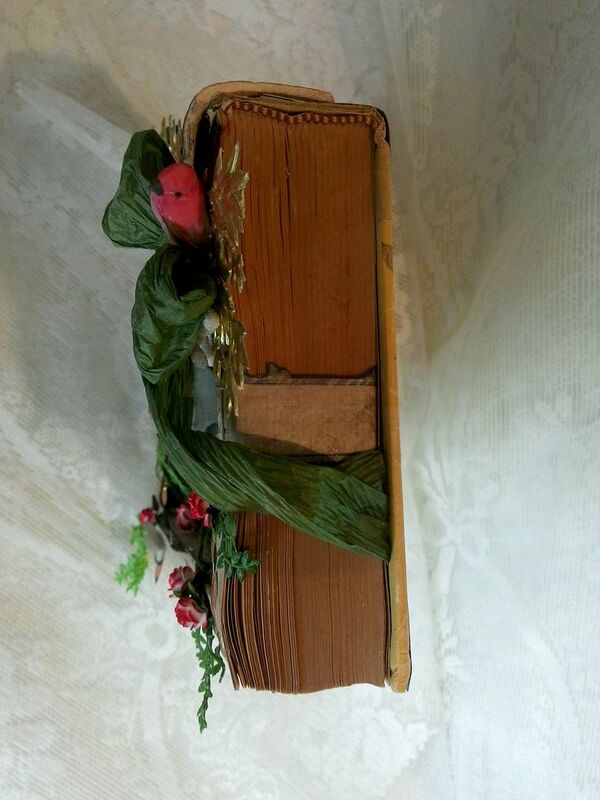 Next, I glued the clay spine to the book. To make the woman and girl appear dimensional, I cut out a second version and used double-stick foam tape to attach them to the book. It was at this point that I decided the clay needed the gold accent to balance the gold hardware. In the corner of the book I added the crinkle paper ribbon. I love using this type of ribbon because it is light weight and holds its shape. I tucked the ends of the ribbon in between pages of the book and underneath the clay. I also added Dresden myrtle, white stamen and a little bird. 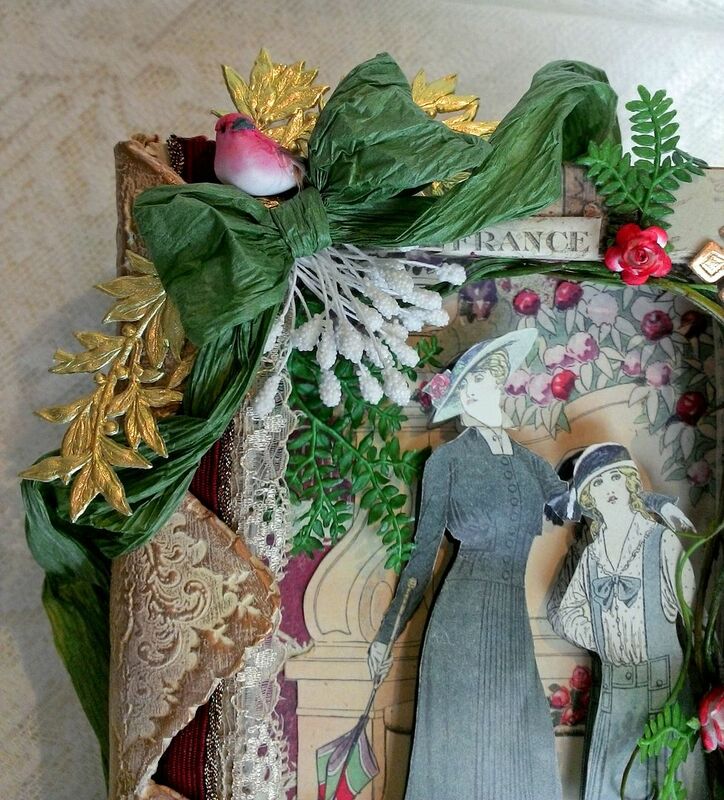 The fern garland is tucked into the shadowbox and some of the leaves are glued to the front of the book. I added variegated roses for color. Since the clay did not wrap all the way around the spine and to add a decorative element I bent and attached brass filigree. Continuing on with altered bottles is something to wear. 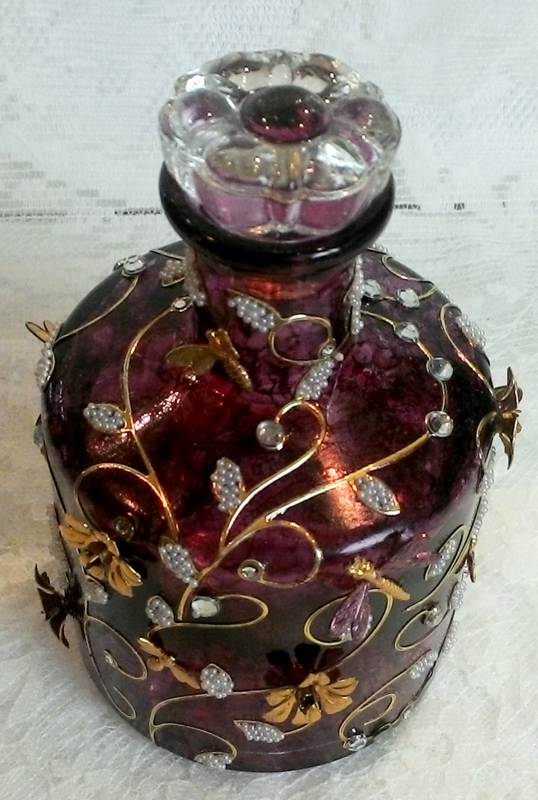 The bottle is painted with alcohol ink. 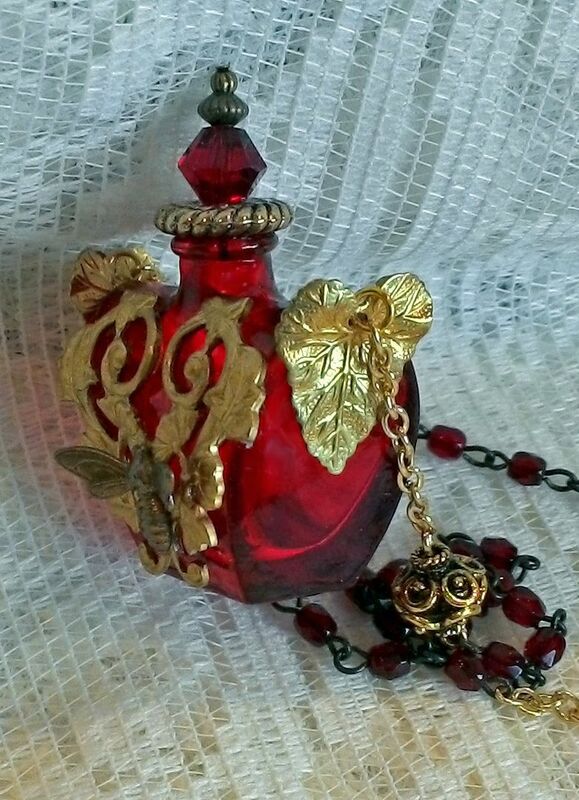 I used the leaves on the sides of the bottle to attach the chain. This bottle was a real find at the craft store last year. I bought three in all, with each having a different butterfly stopper. 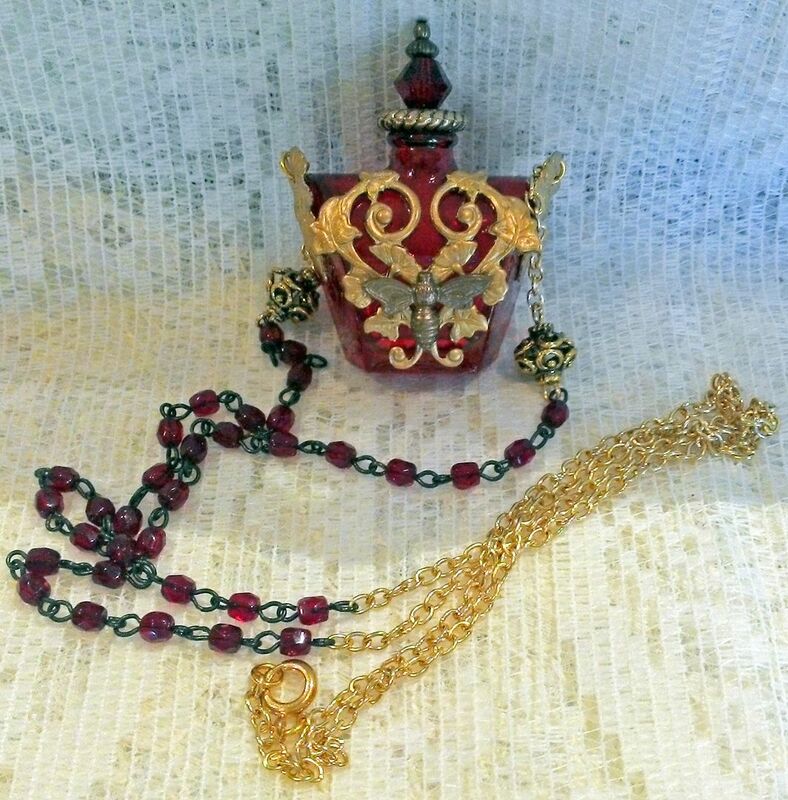 They are clear bottles with the beautiful cloisonné butterfly stoppers. 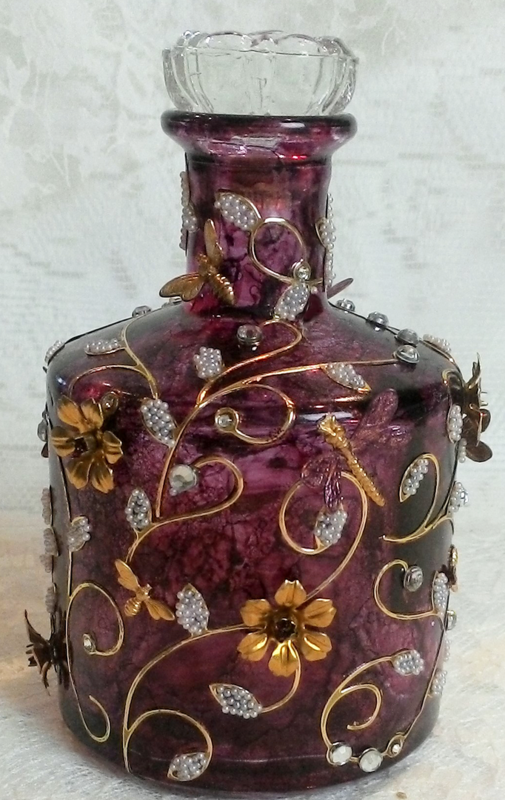 To alter the bottle I started by applying the metallic gold leaf stickers. I filled the gaps in the leaves with micaflakes. 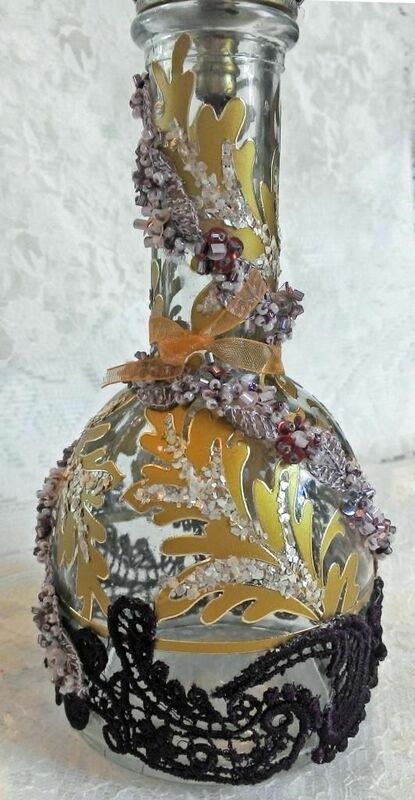 At the base of the bottle I added lace and draped around the bottle is beaded trim. 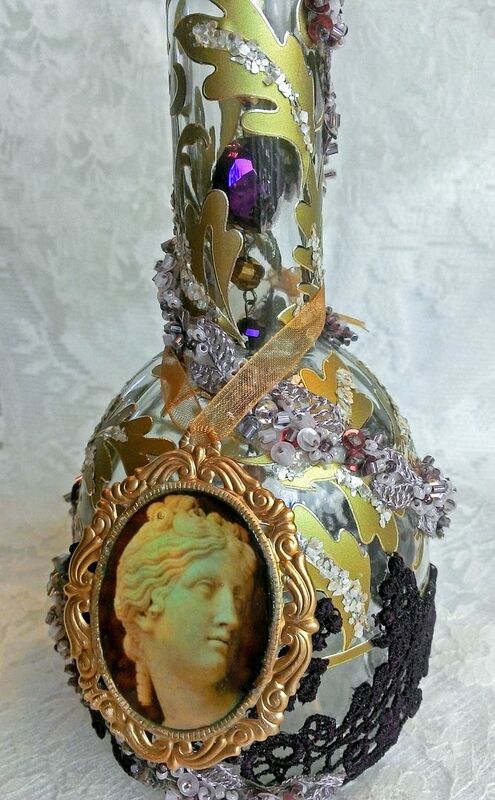 Lastly, I added a cameo with a Greek statue image that I domed by using Glossy Accents. I removed the rubber part of the stopper to expose the shaft. To the indented area at the base of the shaft I added a string of beads. You can see the beads dangling inside the bottle. Thanks for all of your lovely comments about the first bottle. There are many more to come and with some of the posts I’ll have more formal tutorials. My work tables are currently covered in all kinds of bottles and bits and bobs to alter them. If bottles are your thing, stay tuned for several future bottle posts (some with tutorials). 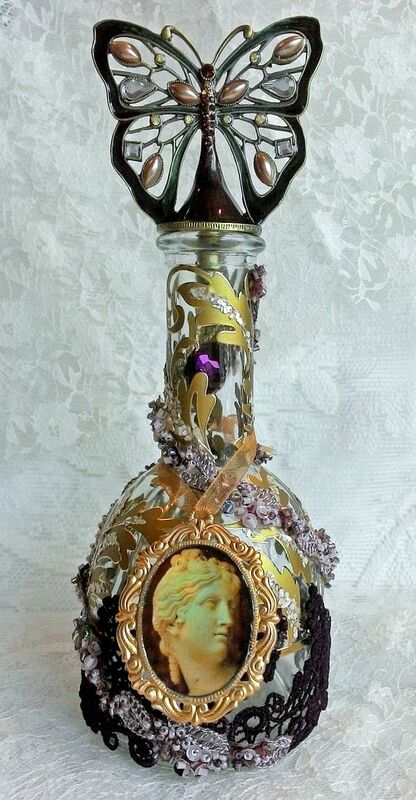 This particular bottle is colored with Alcohol Ink. The gold stems and leaves are metallic stickers. I filled the leaves with microbeads and added rhinestones to the round areas. The final touches are the brass dragonflies, bees and flowers. 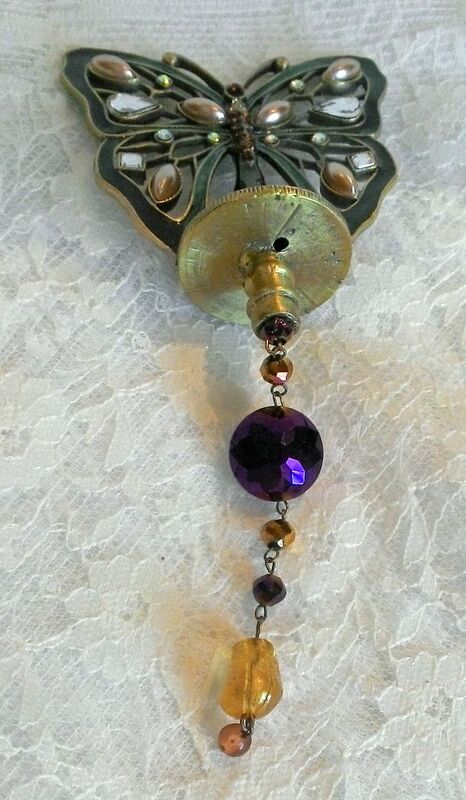 The stopper is a crystal drawer pull.